Cristian Serrano has superpowers. He can run really fast, leap high in the air, and is super smart just like Batman – one of his favorite superheroes. Earlier this year, the 5-year-old called upon all of his superhero powers to get better. "He went to bed one night feeling perfectly fine," said Talia Serrano, Cristian's mom. "He woke up with a rash all over and a fever." She took Cristian to his pediatrician, who diagnosed him with scarlet fever and put him on antibiotics. But the fever kept climbing, and he was not feeling any better. 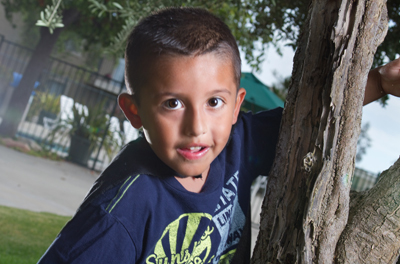 Not knowing what to do next, Talia brought Cristian to Rady Children's Hospital-San Diego. "When Cristian came in to the emergency department, we confirmed his pediatrician's findings," said Adriana Tremoulet, M.D., associate director of the University of California, San Diego Kawasaki Disease Research Center. At the Sam S. and Rose Stein Emergency Care Center, Cristian's blood work showed mild inflammation of the liver. He had an echocardiogram that was normal. Dr. Tremoulet suspected Kawasaki disease – a condition in which blood vessel inflammation occurs throughout the body – but she couldn't confirm it based on Cristian's symptoms. As there is no single test for Kawasaki disease, doctors evaluate symptoms and blood work to diagnose it. Dr. Tremoulet educated Talia on what signs and symptoms to look for: red eyes, swollen hands or feet, bright red or cracked lips, a "strawberry tongue" (bright red tongue with bumps), swollen glands of the neck, or peeling fingers and toes. She was instructed to bring Cristian back if any of these occurred. It had been about two weeks since Cristian's symptoms first started. His fever was still present, he developed red eyes, and his hands and feet started peeling significantly. It hurt him to walk or touch anything. Talia brought him back in to Rady Children's, and Cristian was admitted for treatment of Kawasaki disease. Left untreated, the disease can cause the heart's arteries to swell and form an aneurysm. Rarely, these aneurysms can clot off, causing a heart attack. "It's a self-limited disease, so eventually children who are not treated will get better, but the heart complications that can occur can be dangerous," said Jane C. Burns, M.D., director of the Kawasaki Disease Clinic at Rady Children's, director of the Kawasaki Disease Research Center at UC San Diego and co-director of the Division of Allergy, Immunology and Rheumatology at Rady Children's/UC San Diego School of Medicine. Said Dr. Tremoulet, "Cristian's mom did exactly what she should have done. We are working to increase awareness of Kawasaki disease in the community at large. The incidence rate for Kawasaki disease is five times higher than that of tuberculosis in children in San Diego County, yet not many people have ever heard of it." Approximately 100 children in San Diego are diagnosed with Kawasaki disease each year, and more than 90 of them are treated at Rady Children's. The Clinic is currently following the health status of 1,300 children in San Diego with the disease. Cristian was treated with aspirin and intravenous immunoglobulin (IVIG). In most cases, only one IVIG treatment is needed. Since he was fever-free and seemed to be feeling better, Cristian was sent home. Within a couple days, though, his fever returned and his eyes turned red again, so he was re-admitted for a second IVIG dose. "After the second dose, the fever slowly faded away and over the next four days, his peeling healed and his eyes returned to normal," Talia said. "If you saw him today, you would never know how sick he really was." Cristian was ill for six weeks. Despite being in and out of the hospital and feeling pretty miserable, he graduated from kindergarten with his classmates and is looking forward to starting first grade in the fall. He shows no signs of problems with his heart's arteries, which can be affected in up to 25 percent of children with Kawasaki disease who have more than 10 days of fever. To make sure he doesn't develop blocked arteries in the future, Cristian will need to have his heart checked periodically for the rest of his life. For more information about Rady Children's Kawasaki Disease Clinic, visit www.rchsd.org.